AMD Director David Hoff has confirmed to TechRadar that there will definitely be new AMD graphics cards available before the end of the year. "It's going to give people some nice things to think about for the holiday shopping," he said. Hoff was chatting to us in the St. Regis hotel, San Francisco, just down the road from where Intel was tearing down the IDF show at the Moscone Centre. AMD showed off its new Fusion APU, the 18w Zacate chip. Hoff was also happy to speak about it's upcoming new range of DirectX 11 graphics cards. "It's certainly more than changing a sticker," he said with a grin. "I wouldn't say it's an absolute, complete from the ground up new architecture .It's a nice, different architecture." It's been a full year since the launch of the HD 5000 series, the first DX11 GPUs, and AMD is only now facing serious competition from Nvidia's competing Fermi cards. 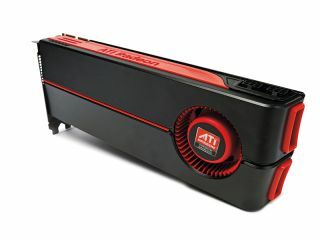 Because of the lack of competition the AMD representatives agreed that was the reason there had been no change in the price of its cards since launch. "We're right about that point where we should do a refresh," Hoff said. "A one year cadence is about the best you're ever going to see on a new architecture," he continued. "We've got another unbelievable launch, with a wide range of products. That's about the best we could dream of." He confirmed that it wouldn't just be the high-end card hitting the shelves by Christmas either. It wont be the full lineup, but we will see multiple SKUs of the card with the complete range following very quicky.